BPB is the number one bachelor party organizer since 2008, when it opened its door. #1 bachelor organizer in term of opening date, choice of activities, reputation and quality service. Since 2008, more than 4,000 groups trusted us with their party. A few small companies (names available on request) tried to copy our concept and miserably failed at it. 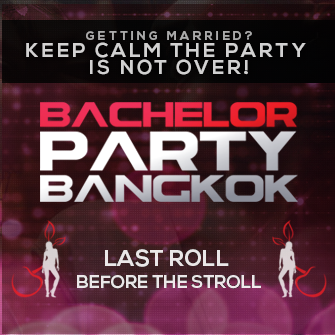 Keep in mind, there is only one real bachelor party organiser in Thailand. Most of them out there are scammers offering cheap prices to make you book, then disappear once your paid your deposit. We got files of hundreds of case like that. You can call us anytime if you have question or need of help. If we can do anything to make your trip, we will make it happen. BPB managers got 25 + years’ experience with private event organisation. We will advise which services would be the most appropriate for you based on your needs, requirements and budget. BPB offer the largest choices of services and activities for your bachelor party. With more than 500 services and activities in Bangkok, Pattaya and Phuket, whatever you are looking for, we got it for you! Already 15 years of partnerships with the best villas, clubs, gogo bars, day activities, yachts and of course our catalogue of girls! With our team of international managers (Thai, French, Indian, German) we are used to deal with customers from any nationality or the language, especially Indian nationals are our speciality! If your main concern is the girls provided for your event, do not look further, you’re in the best possible hands! When selecting your event organizer, you must be very careful about the girls’ part. Most of agencies, when not scammers, will send girls that won’t be the ones you selected on the pictures, fat, with pimple, braces etc and will find an excuse ‘’the girls you selected were not available at the last minutes so we changed for the ones available’’. At BPB, we offer the best looking and above all the most fun girls you can find in Thailand. These girls are working with us for more than 10 years and know how to get the party crazy! For your short stay in Thailand you wouldn’t want to get stuck with ugly girls, not fun, always on their phones, etc. When selecting your agency, if the girls are cheap, something fishy is going on there, by choosing the cheapest girls, you will get the poorest service! All our managers are living in Thailand for more than 10 years and know the cities (Bangkok, Pattaya, Phuket) inside out. Our team of international party insiders will guide you through the best services, activities and venues for your party with passion and dedication. At BPB, we are the party! Our goal is to provide the best customer service to get repeated business on the long run. For that purpose, we always take the best care of our customers and always make sure they are having the best possible time during their stay here. Be very careful with scammers, there are a lot out there! We got a list of real bachelor organizers and total scammers, this list is available on demand. Please have a look at our article ‘’How to select your event organizer’’ , there are some details (registered company, FB page, reviews, etc) that will help you avoid being scammed. We regularly receive calls from customers who booked with another agent, when they arrive in Thailand, because they cannot reach their agent anymore. Nothing is actually waiting for them when they arrive, they lose their deposit and their time. Scammers usually speak with you until you arrive in Thailand, and this is where everything goes wrong.. No way to contact them anymore, no yacht or limo booked, no girls, nothing! Finally, they all end up with us for their party. Better be safe than sorry! BPB Bangkok is the only bachelor party organizer owning its vehicles. We bought and customized our party minivans with LED minibars, Disco lights, powerful sound systems and party atmosphere, every little detail is well though to make sure the party never stops and you only get the best of the best. Every other company will sub-lease their minivans, which are standard minivans, with no additional party equipment. Please do not mix up our ‘’Funky minivans’’ with the standard ‘’VIP minivans’’ offered by the other agents. Minivans aside, the 3 only party vehicles you can find in Thailand are the White stretch Limo (12 seaters) the Black stretch limo (8 seaters) and the best of the best: Our party bus! We own and take the best possible care of them to make sure you get the best. No excuse of vehicles being late, unavailable or broken, these are our vehicles, we take full responsibilities and make sure you will get what you paid for. All the other agencies will have to go through us to book party vehicles for their customers, implicitly meaning that we will 100% offer the best rates and a total control on our service. BPB will purchase its first VIP yacht in September 2018. Every group got different expectations and every event is different. In order to offer you the program the most adapted to your requirements, we carefully listen to you, understand your expectations and requirements and suggest the most appropriate services on that base. We’re not the kind of company throwing a standard formatted program, without listening to your needs. All our services are adapted for each group. With more than 150 requests per month, this is a hard work but necessary to adapt our offers to your needs and budget.